In September I stopped in PurlDiva and treated myself to two skeins of Misty Alpaca Chunky. I'm not a big yarn horder, I typically only buy for specific projects, so I had admired and passed on this yarn on a couple different occasions. But on this particular day it had been a long week, and Misty Alpaca feels like soft cuddly air and Purl Diva had it stocked in one of my favorite colors, so how could I resist?? 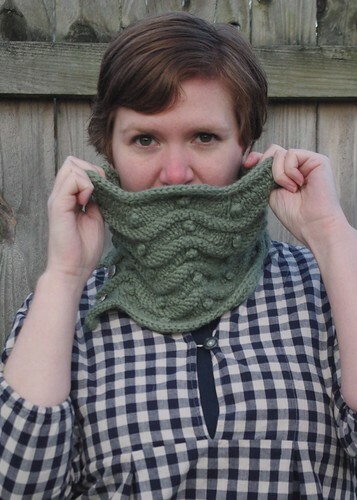 As soon as I had a break from all that November knitting, I turned that yarn into this Bob & Wave cowl. The color reminded me of 1950s Cadillacs, so I wanted do do something with a retro feel and nothing feels more like retro knitting to me than bobbles. Though it's a small and relatively quick project, there are a lot of fun details. 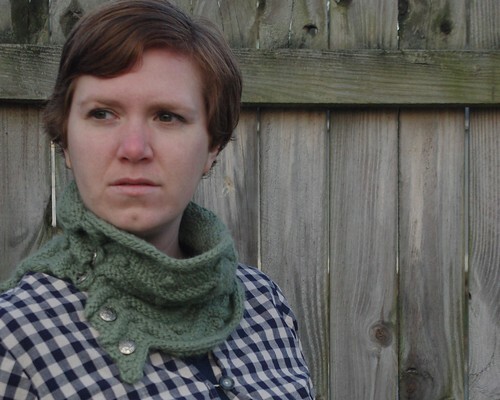 The cowl features an i-cord cast on and bind off. I-cord also appears as the button loops and faux i-cord is created by rows of purl stitches that are pleated horizontally to make the texture really pop. 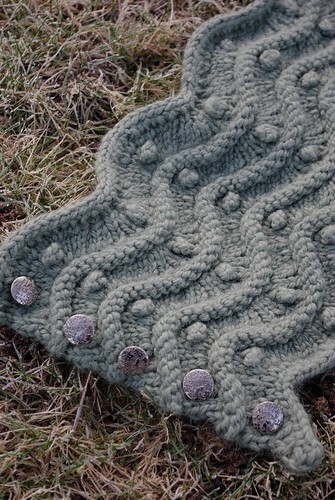 Carefully placed increases and decreases create the scalloped waving background for the bobbles and the fabric manipulation makes for a denser and warmer cowl. 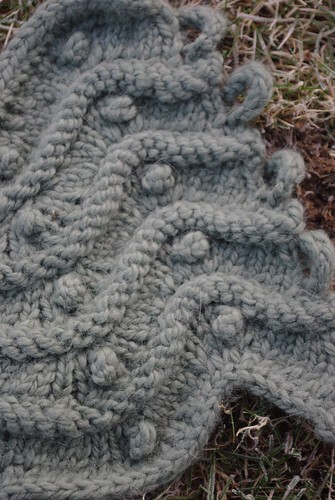 The project uses two skeins of Misti Alpaca or 175 yds of cozy chunky yarn and measures 22”/ 56 cm long, 9”/23cm high. or you can queue it up on Ravelry. 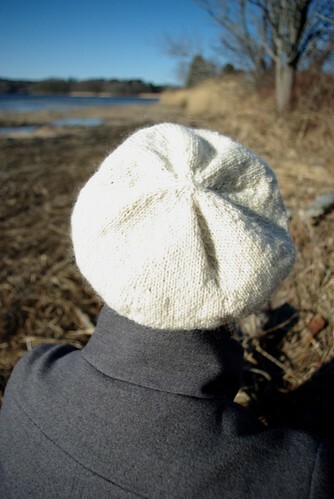 To find out about new pattern releases and special offers, sign up for the Ms. Cleaver Mailing List. 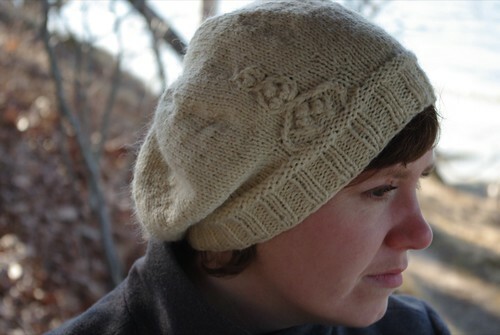 I hope no one minds seeing a very woolly pattern with winter in the name in the midst of spring (at least in this hemisphere), but I'm so excited to finally get this pattern out in the world that I couldn't wait for more appropriate weather. This hat and glove set is one of those "necessity is the mother of creation" projects. 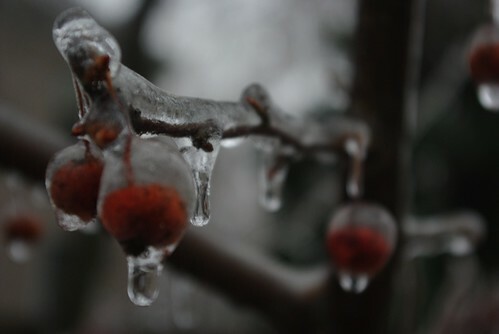 In back in late 2008(! 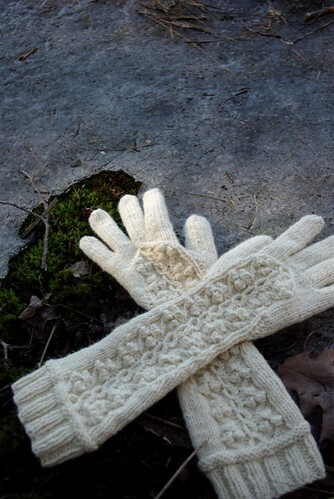 ), my dear friend Kasey requested some knitted elbow-length gloves to go with a 3/4 sleeve coat she had purchased. 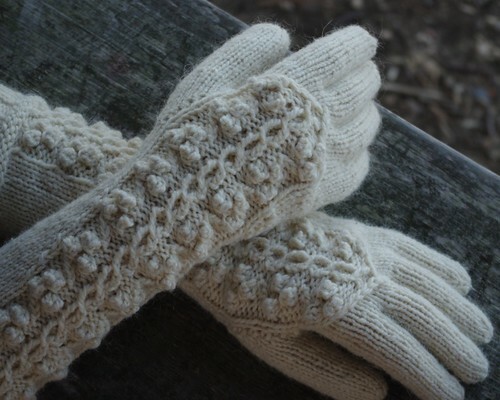 I was happy to oblige and even though I'd only made a pair of Nordic mittens and no gloves at all, I decided that I needed to design the gloves myself. The structure didn't change all that much from these originals, with the exception of the thumb, which was improved in the final version. 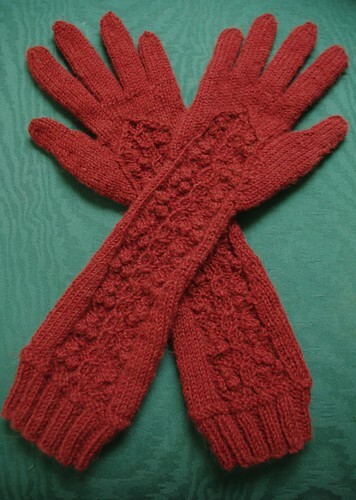 The red gloves were knit in Ultra Alpaca, which was soft and lovely, but was lacking in the stitch definition I thought the cable panel needed and the sturdiness which gloves require. For the final version, then I chose to knit with Peace Fleece Worsted in Antarctica White, which I found to be a very flattering shade. With both the Peace Fleece and the Ultra Alpaca, the gloves used a skein and just a teeny bit of a second skein - usually just to finish the fingers on the second hand, so I decide to work up a beret with a complimentary cable pattern. Aside from the cable, the beret is a simple knit, but is just the right size for pulling down over the ears for true warmth. 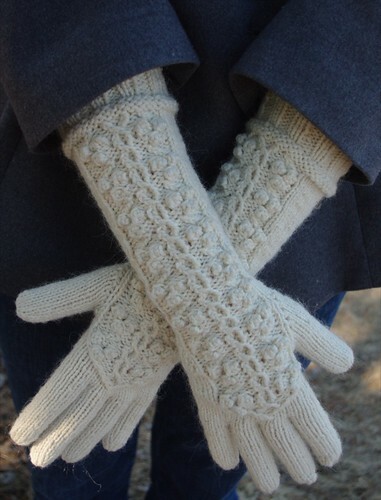 The patterns requires some cabling without a cable needle, which is fully explained in the pattern notes and the gloves utilize a 8-row cable repeat, with row counts at the end of each section to keep on track. The gloves are fitted from elbow to wrist and the hat ribbing is knit on smaller needles to remain cozy for a multitude of head sizes.